An instant #1 New York Times bestseller (February 2018)! Ernt Allbright can’t run far enough to escape his demons. Going off-grid in Alaska, Ernt drags his wife, Cora, and his daughter, Leni, into a wilderness experience none of them are prepared for in an effort to start a new life. They must learn to garden, hunt, and gather as much food as possible to survive the long winter, guarding against bears, wolves, and other predators that would destroy their home. The townspeople donate livestock and helpfully train the small family in homesteading skills to improve their chances of holding on until spring. As time goes by, Leni finds new friendships even as her father alienates the townspeople. As the winter days shorten and daylight slips away, Ernt’s grip on his temper and sanity wanes and his family will pay the price. There’s a lot of love in The Great Alone: a mother’s love, a friend’s love, a family’s love, romantic love, and dysfunctional love. Some of the romances are rock-solid and life-affirming. One romance is love at its best: patient, enduring, and indelible. However, the dysfunctional love that binds Ernt and Cora intersperses abusive episodes with declarations of love, regret, and broken promises. The residents of Kaneq, Alaska, don’t understand why Leni’s mother doesn’t tell someone, doesn’t leave, doesn’t accept help, why she doesn’t stop loving her abusive husband. They don’t understand why Leni doesn’t leave her parents and escape to college. But I can relate. It takes years to grow past the fear of telling people that one of your parents is hurting the other or hurting you and your siblings. Hiding becomes ingrained. Your family closes its ranks and stands alone against the world. There’s a wall that must not be breached. Your family pretends that the bruises and broken bones are from accidents. It becomes normal to both love and fear your parent. I think Kristin Hannah beautifully captures the essence of that conflict and dichotomy. I couldn’t sleep last night, and The Great Alone caught my eye as I was perusing Kindle books and nomming on a Skor bar hoping to feel sleep sneaking up on me. So quickly was I caught by this book that half my Skor bar still remains stranded on my bureau, abandoned when I nabbed my tablet and snuck to my recliner without waking the significant other. The story was so enthralling that I devoured it in one extended sitting broken only by puppy potty breaks. The Great Alone is a chilling, emotionally wrenching roller coaster ride. 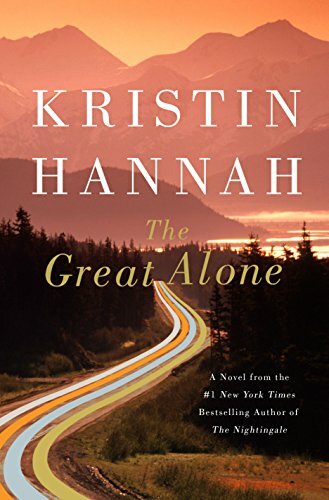 Kristin Hannah has created characters that are believable and realistically populate her vision of a child caught between a parent she loves and cannot abandon and a parent who claims to love her. In the midst of becoming a warrior capable of surviving her family, Alaska, hard choices, and the tragedies that rock her world, Leni discovers the true families that love her. It’s hard to write about this book and not include spoilers, so I’ll stop here and just say that there is a lot of sorrow (ask my Kleenex box about it), growth, and even joy in The Great Alone. For all its pain, this tale is unforgettably uplifting. Highly recommended. Edited for TMI and again to add in love as an element, since my review overly emphasized the sadder elements of the storyline. This is a spectacular epic. A love for Alaska shines through the twisting, turning story of a small family who love and hurt each other. We see the horror of war in it’s after effects. The glimpse of life in the 1970’s. Our heroine is a child who moves so often she never fits in. Her father is left property in Alaska by his army friend who didn’t make it back. When the story moves to Alaska everything comes vividly alive, the scenery, the characters and the story. It was everything! Beauty, tragedy, love and redemption. Riveting, horrifying and absolutely wonderful. I highly recommend this soon to be classic. This book is amazing. This story is so compelling there are parts that are painful to read. But keep reading! This is the story of a dysfunctional family torn apart by domestic violence that is born in the aftermath of the father’s time as a prisoner of war in Vietnam. He came home to his wife and daughter a fractured man. This is a love story. The love of a wife, Cora, for her tortured husband. A love so strong that it blinds her ability to see what their troubled relationship is doing to their daughter. The love of a daughter, Leni, for her mother. A love so strong that it withstands the violence Leni sees at the hands of her father to her mother. This is a love story to Alaska–its natural beauty and the beauty of its independent people in the 70’s. “Everyone here is either running from something or to something.” I have been involved in the criminal justice business for 35 years. Never have I read such an honest portrayal of a fictional family in the throes of Domestic Violence. Kristen Hannah has done a masterful job at making such a tough topic readable and still teaching the reader of the tsunami effect that DV has on everyone it touches.